Not surprisingly the Moto G4 is missing the sort of headline features you'd get in a flagship device, but there's still a lot to love here. One highlight is the display, and there's a major upgrade here compared to last year's Moto G.
The G4's display is a little larger than the one on the Moto G (2015), at 5.5 inches rather than 5 inches, and unlike the previous phone's screen the G4's is Full HD. The bezels around the screen are much slimmer than before, helping to make this the best-looking display yet on a Moto. The display is nice and bright, and I never found myself struggling to see the screen, as visibility at extreme viewing angles is among the best I've seen recently. The auto brightness mode also updates quickly – coming straight from the Obi MV1, on which auto brightness was an issue, it's a joy to see the display adapt so quickly when the lighting changes. While the screen on the Moto G is large, it's easy to use. I never struggled to reach anything part of it, although some people who were able to use the Moto G (2015) one-handed may have to get used to using two hands here. Everything looks much better on the Moto G4 than on its predecessor thanks to the Full HD screen. It's a welcome step-up in screen quality. The Moto G (2015) had 294 pixels per inch, but the new phone blows that out of the water with 401ppi. 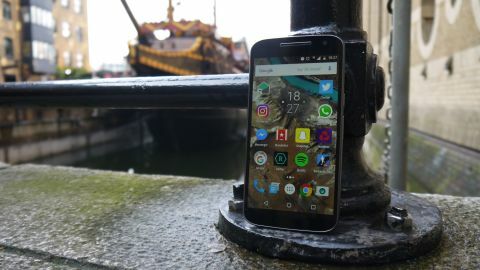 If you're after a cheap phone with a beautiful display, you won't go wrong with the Moto G4. Storage is another key feature on the Moto G4. It's available in either 16GB or 32GB versions, which doesn't seem particularly revolutionary until you consider that the previous model offered a measly 8GB. While 16GB isn't massive it's enough to take care of the basics, while 32GB is even better – and there's an impressive 256GB of microSD support available as well. That's the most we've seen on offer in a smartphone. In fact, there aren't that many 256GB microSD cards available, and if you do want one it's going to cost you quite a bit, but it's good to see Motorola pushing the boundaries when it comes to storage.